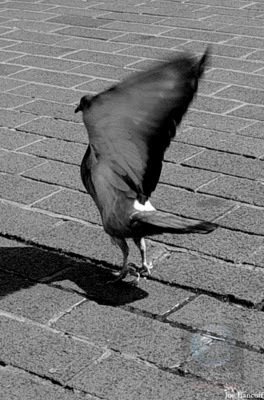 A pigeon executing the "clapping" phase of the lift-enhancing mechanism--the "clap and fling." Animal and insect wings are considerably different from those of an airplane. As a result, it isn’t much of a surprise that they use different mechanisms to generate lift. One of these peculiar mechanisms is the “clap and fling.” Torkel Weis-Fogh introduced this mechanism in order to explain the aerodynamic forces that some insects are able to produce. In contrast to the conventional methods of flapping, the animals and insects that use the phenomenon of the clap and fling increase lift by removing the Wagner effect, which is that the ratio of instantaneous to steady circulation grows as the trailing edge vortex distances itself from the airfoil. 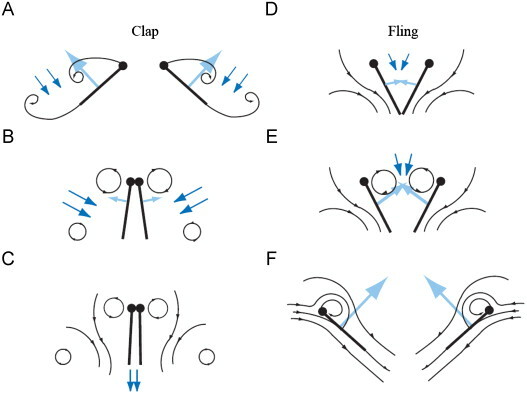 The clap and fling mechanism consists of two phases: (1) the leading edges of both wings are clapped together at the end of the upstroke and (2) the wings rotate around their trailing edges, thus flinging apart. A representation of the "Clap and Fling" mechanism. During the “fling” phase, or the down stroke, air flows around the leading edge of each wing which creates a bound vortex on each wing acting as the starting vortex for the opposite wing. This allows a rapid buildup of circulation as well as an increase in total lift production. Even though this method is used by most small insects, it does have some disadvantages. For instance, constant “clapping” can damage an insect’s wings. As a result, an incomplete “clapping” will be performed by the insect for minimal damage. Although this mechanism was first discovered in small insects, large flyers are capable of using the clap and fling method. For example, a pigeon uses the clap and fling method during take-off, which is usually why a sound is produced when the pigeon “claps” its wings together. It is assumed that the “clap and fling” method improves a bird’s take-off performance as it provides that extra lift. 1.) Clap and Fling, Aero Evo, June 2012. 3.) The Biomechanics of Insect Flight, 2000.